Langtang Gosainkunda Helambu trek offers the great view of Langtang Himalayan ranges which are mainly dominated Langtang Lirung (7,227m), Xisapangma (8,103 m), Gnash Himal family and several other high Mountains on the upper valley and straddles the Tibetan border. Spring time is much better here to see flowers and birds. Furthermore, legend says that a lama following a runaway yak discovered this valley, hence the name -Lang (Tibetan name for YAK), Tang (more currently “Dhang” means to follow). 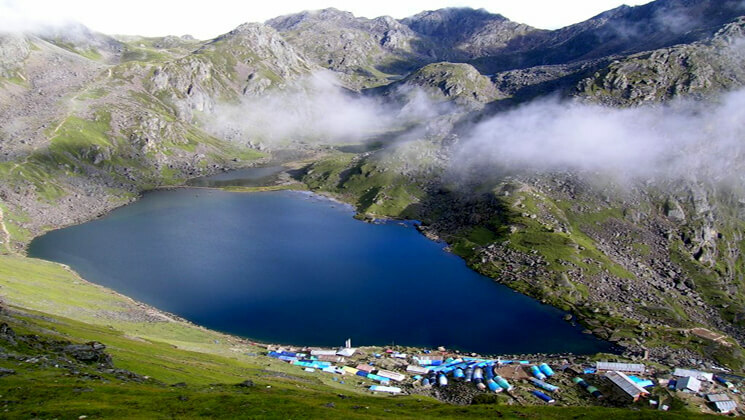 Visiting Gosainkunda is an important pilgrimage destination for all travelers. As you go Helambu from here, you need to walk over a Suryakunda high pass 4630 meter that brings us almost to the edge of Kathmandu. And finally, Helambu is a great valley to discover Buddhism. Langtang gosaikunda and Helambu trek offers comfortable accommodation with delicious cuisines run by the local inhabitants where you can touch the local hospitality. Besides that, you can experience in Langtang gosaikunda Helambu trek as off The Beaten Path trail, Low-risk factors, financially cheaper, unspoiled culture and natural biodiversity, beautiful mountain scenery, Buddhist Monasteries…etc. Langtang Gosainkunda Helambu trek is a part of Great Himalayan Trail (GHT) trekking in Nepal. Langtang valley combine with Gosaikunda and Helambu trek/hiking is suitable for any walker looking for something a little more challenging. It does not require you to be super fit or have any previous trekking experience. If you are healthy and can walk 5 to 6 hours daily, you can complete this trekking. However, daily jogging or walking exercise is useful before your departure. Our program always includes rest days and build up gradually, in order to acclimatize to the altitude. On the trek, you can go at your own pace, with plenty of stops for resting. In the morning after breakfast, we began our sightseeing with a professional private tour guide. Today’s sightseeing we visit Boudhanath, also known as Little Tibet. Then we visit Pashupatinath, holy temple of Hindu where cremation takes place by the holy river Bagmati. Later we visit Patan Durbar Square, Kathmandu Durbar Square, and Syambhunath Stupa. And transfer to hotel. At early morning, our guide will come to pick you up at your hotel, meet the crew than drive on a northern highway over mountain ridges to Syabru bensi bazaar. Then go to check in and we stay overnight in the guest house. The journey takes about 8 hours through picturesque landscapes, mountain scenery, and local villages. From Syabru we’ll have magnificent views of Mt. Ganesh Himal, Manaslu and Mt Kerung of Tibet. We’ll relax tonight at a local teahouse. Our journey ascends for around two hours through the forest followed by a climb of about an hour to reach Bamboo village (1,850m/6,068ft) where we stop for lunch. As you ascend further, you can see wild Bee hives hanging on a cliff which is another attraction for the trekkers. The journey continues further steeply climb through the bamboo forest to reach the Lama Hotel where we’ll rest and overnight at a local guesthouse. From Lama Hotel the trail climbs through a forest of oaks, maples, hemlock, and rhododendron observing glimpses of mount Langtang Lirung, reaches to Gumanchok (2,800m) and then climbs to Ghora Tabela 2970m/ 9,712 ft after which it descends to Thangshyap (3,140m). The trail further climbs to Langtang, which is the headquarter for Langtang National Park. Overnight in Langtang Valley. From Langtang Valley the trail climbs gradually to Sindum and to Yamphu (3,640m). Crossing the river then climbs a moraine to a viewpoint where you can see Kyanjin Gompa and the dramatic Langtang ice fall flowing from Langtang Lirung and Kinshung. Then we reach Kyanjin Gompa where we stay overnight. During the afternoon, you might walk up to Kyangin ridge (kyanjin ri) to achieve better Himalayan scenery. This morning we’ll retrace our steps somewhat as we head back from the Gompa. We have an easy downhill and pleasant walk through mixed with the rhododendron forest to Lama Hotel where we’ll rest for the night before continuing our journey tomorrow for the Thulo Syabru village, overnight stay in lodge. Trek leads again through bamboo bushes and rhododendron forest where we may see the local wild boar as well as other animal and bird lives on the route to Thulo Syabru. During the day hiking, we’ll have marvelous views of Mount Ganesh Himal, so close it seems like it’s beside us. Firstly easy downhill follows the river bank but last part steeply uphill for a couple of hours to get to the village, overnight stay in a lodge. The trail takes a steep to ascend to Dursagang and then through the forests of oak and hemlock passing an old chorten to the top of the ridge at Foprang hill and then to Chadan Bari 3330m /10,889 ft, this place’s main attraction is Sing Gompa where you can taste of real YAK cheese. Chandanbari is commonly known as Sing Gompa. Stay overnight stay in lodge. Climbing steeply from Sing Gompa at several points the trail crossing behind the ridges moves in deep forests to Cholang Pati. Continue our trek on the way to Gosainkunda passing Laurebina Yak or recognize a lower Lauribinala hill station. We continue to ascend to the ridge and then climb to Saraswati Kund and Bhairav Kund continues climbing gently and then drop about 20m to reach to the lake Gosaikunda where we stay overnight. A tough day of whole trekking. Leaving Gosaikunda the trail moves to Gopte, passing three more pristine lakes, we reach to Laurebina La upper hill station which is located at an altitude of 4630m, then easy descend downhill to Phedi, from where the route drops to a stream and crosses the head of the valley, descending to Dupi Chaur, with all these ups and downs we make a final ascent to Tharepati, a windy ridge. Overnight stay in lodge. Crossing over a stream via a suspension bridge, we follow the trail as it makes a short final climb to reach the prosperous Sherpa village of Melamchi Gaun. The trail continues its descent to the Melamchi Khola (river). After crossing the bridge the trail begins to climb up the other side of the valley towards Tarkyagang. Tarkeghyang is the largest village in Helambu area and the main destination for trekkers traveling in this region to explore the local lifestyles of Sherpa and their tradition. An optional trip would be descending to chisopani than to sundarijal, Kathmandu. Overnight stay in a lodge. We left the big village of Tarkyagang the trail makes a sweep around the head of the wide valley between Parachin and the pretty village of Gangjwal at around 8,200 ft. The trail then drops downhill from the edge of the ridge and continues at around the same altitude along the side of the bridge crossing over a number of streams and waterfalls. Now, we arrive at Gompa, we need to pass it before reaching Sermanthang village where we stay overnight. An easy day walking downhill to get Melamchi pul bazaar. After passing a large Gompa at the southern end of the village the trail undulates along the west side of the ridge, pass some Buddhist chortens before dropping down to Kakani. From here the trail descends again to the small village of Dubochaur and continues to descend even more steeply across the ridge to the junction of the Indrawati and Melamchi river. We’ll cross the suspension bridge over the Melamchi River to reach at Melamchi Pul Bazaar for our lunch. Then drive to Kathmandu. This pleasant day you may have full day at leisure and either relax at hotel or explore Kathmandu city, shopping etc. How much does Langtang gosaikunda and Helambu trek cost? About Langtang gosaikunda and Helambu trek price will vary according to group size you are coming with. 3-star category hotel deluxe air-conditioned room in Kathmandu (BB PLAN) and 2 / 5-star hotel standard accommodation in Pokhara (BB plan) with attached bathroom while on trekking on possible places. AND WE ARE OPEN TO CUSTOMIZE YOUR TOUR AND PACKAGES PRICE AS PER YOUR REQUIREMENTS. International tour leaders are highly encouraged to get discount and attractive complimentary. We can organize private langtang gosaikunda and helambu trek starting at any date that works for you. Please contact us for more information. Question: Do I need experience for Langtang gosaikunda Helambu express trekking? Answer: This trekking is suitable for keen trekkers/walkers who can walk about 5 or 6 hours in a day, with a lightweight rucksack you can complete this trip. Question: What kind of accommodation can I expect on Langtang gosaikunda Helambu short trekking? Question: What kind of food can I expect in Langtang gosaikunda Helambu express Trek? The dinner and breakfast are provided in the same lodge you spend over night every day and Lunch will be provided on the way to the next place where you are going. Question: What opportunities will I have for a shower along Langtang gosaikunda Helambu Trekking? Question: How do I get drinking water on Langtang gosaikunda Helambu normal trekking? Answer: During the trekking route there are all places hotel and shops where you can able to buy mineral water and you can buy it for drinking but however we advise against buying mineral water in plastic bottles, as currently there are no provisions for disposing of these. Instead, we provide you with boiled water or bringing chlorine tablets to purify the normal water as the normal water is available in campsite/along the way in the camping trekking. Answer: During the guest house trekking there will be enough chances to charge your battery. We recommend you bring an extra pair for in case. Remember to bring your own adapters! Question: Is there any communication facilities on Langtang gosaikunda Helambu Trekking? Question: Who will carry my luggage on Langtang gosaikunda Helambu Trekking? Question: Is there any communication while we are on Langtang gosaikunda Helambu Trekking? Answer: When walking/trekking in the mountains, the distance covers each day can vary greatly due to a gradient, terrain, and altitude. As such it is very hard to give specific distances on each day, however, you have to be prepared to walk for 5-6 hours each day. Question: Do I need walking polls for Langtang gosaikunda Helambu Trekking? Answer: You can allocate US$ 08 – 10 for lunch/dinner in Kathmandu and it depends on your spending habits. US$7 to 10 US$ a day will be enough to buy bottles of water, chocolates, tea/coffee and some drinks for trekking. Answer: The above itineraries are subject to change due to condition beyond our control. This is a Guide line showing tentative camp night stops. Physical, technical and natural condition may change this above itineraries.